Slick Productions - Now Atkins friendly! Jade is a Final Fantasy 2 hacking utility. My praise of Disch's program, FFHackster, and my desire to learn C++ is what started this project. My experience as a rom hacker is also improving as Jade progresses. Right now it is debatable whether or not you could make a "great" hack, mostly because what Jade lacks is what usually makes a "great" hack. But, that's all in the eye of the beholder in my opinion. One way or another, I hope you enjoy what it can do. Armor Editor: It can edit everything related to armor, including stat boosts, elemental properties, defense, and so on. Character Editor: It can edit HP, MP, strength, and every other stat. It can also edit any spells, weapon skills, and equipment your characters start out with. Short of editing the sprites and pattern tables themselves, this can do it all. Font Editor: Right now, a waste of space. All it does is display the font, nothing more. 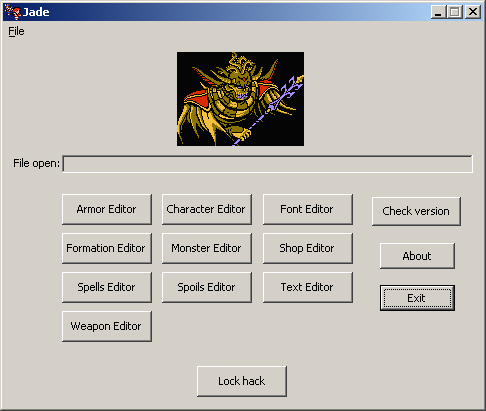 Formation Editor: It can edit the formation setups, which follow a similar format to Final Fantasy 1. As of now, it can change palette assignments, what two palettes are used in battle, how many of each monster you can enouncter, and which monster's you'll encounter. There's also an unknown byte, which I think has something to do with ambush rate, but testing has been inconsistant. Monster Editor: It can edit HP, MP, strength, and every other stat. It can also edit what AI pack to use for each monster, as well as what spells to use in that pack. Short of editing the sprites and pattern tables themselves, this can do it all. Spells Editor: It can edit spell power, what animation it uses (hex value), palette used, any accuracy modifiers, status ailments to be inflicted, elemental properties, and the entire artificial intelligence pack that monsters and weapons use. Spoils Editor: Made because the Monster Editor is too convulted to add more. It can edit what is dropped by every single monster. It is now in the Monster Editor. Text Editor: Still a couple of things missing, but for the most part complete. Dialogue still does not work for the Prototype, that will be addressed in the next version. Without length detection, you'll have to tweak the pointers manually, which is OK too. Weapon Editor: It can edit the attack power, accuracy, evade bonus, elemental properties (which actually work this time around,) bonus damage vs monster types (which actually works this time around,) what spell it can cast, what status ailments a weapon can inflict, what type of weapon it is, and any magical penalties to the user. It cannot edit any graphics ascept, for none have been found.